It was a nice experience speaking with Maruthachalam on a recent Sunday morning. He currently lives in Coimbatore with his wife and two children. He works in the Construction business and has worked and lived across many cities and towns in India and hence is fluent in multiple languages. He recently required money urgently when he had a medical emergency. All of us know how each minute is precious in such a situation, and hospital bills are often daunting. That is when Money View Loans came to his assistance. Why Did Maruthachalam Try Money View Loans for His Requirement? Maruthachalam did approach a bank, but they were willing to give him a lesser loan amount in urgency. He felt that a lower loan amount did not work for him. As he was asking for other options and checking online, he came across an advertisement for Money View loans. He downloaded the App and got the money within one day! The process is as simple as it gets. He downloaded Money View Loans app and followed the step-by-step instructions which were very clear. It helped that he could read the instructions in his local language, Tamil. He uploaded the documents that were mentioned, and within one day Maruthachalam got the money he needed in his bank account. He was absolutely elated. I can imagine the relief he felt since time was of the essence for him due to the medical emergency. He was very appreciative that Money View Loans has a great customer service team that responds quickly to any queries. Online Application Process: Online application process made it very easy for him to cut down the application time. This helped in him getting money at the quickest. Quick Money Disbursal: He needed the money within a day and he got it with Money View Loans. He did not go for a bank loan because they were tardy. No inconvenience: He took care of the medical emergency at home with no time lost in running around chasing bank/money lender for long-winding processes. This was such a welcome relief for him. Money View Loans enabled him to get loan without any hassle at all. No Hidden Terms: Maruthachalam got loan of Rs. 10,000 to Rs 5 lakh within a day with Money View Loans. The terms and conditions were exactly as they were mentioned in the App. 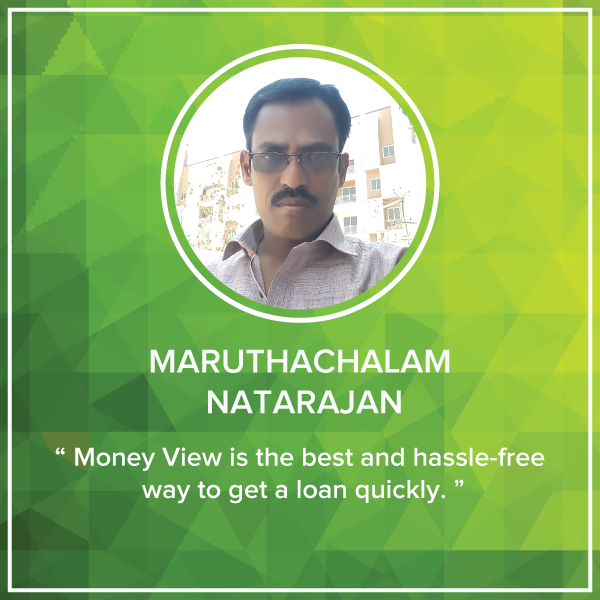 We loved to hear how Money View Loans is helping people like Maruthachalam when they are in need of emergency funds. He is now recommending the App to everyone he knows. He is waiting to take another loan with Money View Loans soon. Thank you for sharing your satisfied tale with us. I am happy to say money view is easy to get quik loan and taking only one hour. And good costumer support. Only thing is rate of interest is very high all other things are good. Thanks Roshan. Glad you like Money View loans.